Olympian, America’s Cup sailor and National Sailing Hall of Fame inductee, Steve Colgate, is the “knowledge” behind all Offshore Sailing School courses. 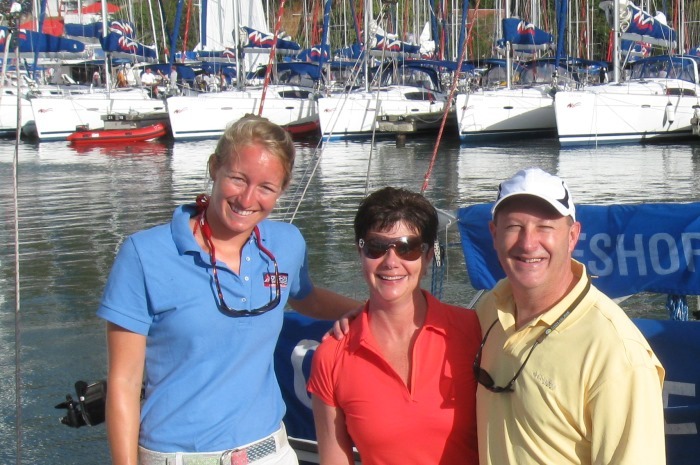 His best practices for teaching sailing, the curriculum he developed for every course, and teaching aides and comprehensive textbooks written by the Colgates are just four of the many reasons why Offshore Sailing School is America’s #1 Sailing School®. professional men and women who are lauded for their knowledge, experience, and teaching abilities – all passionately dedicated to your success. Ask any college professor, pilot or engineer and they will describe the proven methods for learning parallel to how you learn sailing at Offshore Sailing School. Teachers and college professors laud our textbooks, teaching methods and curricula. So buyers beware! Many sailing schools cut corners and don’t cover all you need to know to learn sailing. If they boast “no classroom instruction” you are missing out on some of the most crucial aspects of learning. At Offshore we reinforce everything you do on the water with textbooks sent in advance to study, in-depth delivery of knowledge in the classroom, and then hands-on training aboard each day. In live aboard cruising courses, there is a classroom session each morning aboard before you set sail. There aren’t many companies that make it past 50 years, much less other sailing schools. Founded in 1964, Offshore Sailing School mission is to enhance your life through sailing and make sure you to receive the absolute best sailing education. If you feel we did not live up to your expectations, you may take the course over again, tuition free. If you choose our Fast Track to Cruising Course and cruising is your ultimate goal, you will be ready to charter boats over 40’ with The Moorings and other charter companies around the world.